SRK FC - Part 4! THE KINGDOM OF KOMPLETE KHAN-NESS! The place to express your love, support and respect for King Khan! TO JOIN: Simply introduce yourself and tell us what you 'most' adore about Shahrukh! (Note: we will have an "active members list" that will be updated either daily or weekly, if you are a fan, please try to visit and stay "active," otherwise your name will not be added to (and may be removed from) the "active" list, though you will still be considered a member and supporter)! Guess the Co-Star (Game) - A member writes/posts two or three clues (i.e. character's name, one line from a song, famous dialogue, etc.) and the next member must guess which co-star of SRK's it is! Contests: - CAPTION CONTEST - VOTE NOW! SRK: Hello you should reallie work on ur English..You have not changed since Kabhi Khushi Kabhi Gham… No use flirting with u sweetie!!! Aish:Shahrukh do u have a pen? PLEASE VOTE FOR YOUR FAVORITE! New contests are comin' soon! DOTW (Discussion of the Week) - We will have weekly discussions on different topics and/or issues regarding Shah Rukh Khan. The best answer according to our judge(s) will then be presented! 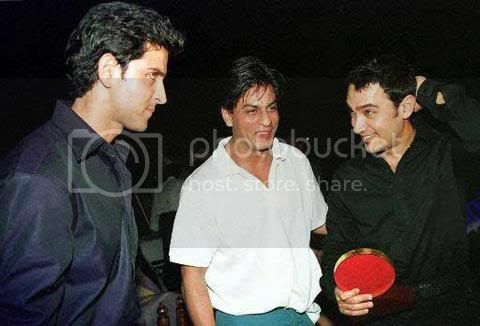 Before SRK, we all know that Farhan was considering Hrithik Roshan to enact the role of DON! Tell us what you think made Farhan change his mind and 'if' he hadn't, do you think Hrithik would've done a fair job portraying the character?! MOW (Member of the Week) - We have been selecting MOW's for our club based on participation and activeness in the club! Currrent MOW: NIYA! (Grill now)! *(I apologize for not changing the style for this part of the club... will edit when and if necessary)! NOTE: If you are posting articles, photographs, etc., please make sure that another member has not already posted the same material! There are sometimes many repeats! It's only natural to not realize or notice, but if and when you do... please kindly edit your post! Well... we are back again and this time we're going to ROCK the club even more, aren't we?! To begin with, let's honor our newest MOW: Doly_455! She is one our sweetest, cutest, friendliest and most active members! She has always proved to be a true SRK'ian through her knowledge and participation in ALL SRK activities! She even has some great ideas of her own (contests (caption and dream date, with help from Zaara) and a couple of games)! So... what are you all waiting for?! Help me in congratulating Doly by presenting her this sig (made by our very own Ayesha) and bombarding her with LOADS of questions! who is ur favorite actress?? which section u visit the most? what do u like about IF? who is ur closest friend in IF? who is ur favorite actor beside srk? wat do u like one thing abt srk? SRK has done many candy floss roles, do you think SRK should enact more reality based roles/characters (types which portray more realistic characters), such as like Dev Saran in KANK?! Don't forget about our contest, game, and DOTW (still continuing from part 3)! Calling' has been postponed , so more screens/cinemas are available . movie's promos and songs . Agnihotri is currently scripting a football film. Khan has been cast as the coach of an all-girls' hockey team. need to give it the respect it deserves." allows me to go into unexplored territory." to get girl players in place before we go into production." wanted to make a film that was completely Indian in spirit." shell and not react to such stories. I'd rather be seen than heard." Actor Abhishek Bachchan has dismissed rumours of tensions between him and Bollywood superstar Shah Rukh Khan and says he would love to work with Khan again. Abhishek can't stop praising Shah Rukh, who he says loves taking care of people. 'He's very hospitable. On the sets he was concerned about everyone. He never indulges in petty bickerings. He's the most selfless person on the sets... He's bothered only about the film, never about himself,' Abhishek told IANS. And the actor reasserts that there were no tensions between anyone on the set of 'KANK' in New York. Bachchan Junior agrees that a lot of his own personality has gone into his performance in 'KANK'. He considers himself lucky to be part of the film as it gave him the opportunity to work with the biggest Bollywood stars. The actor says that 'KANK' is one Karan Johar film that didn't overwhelm him. Abhishek also hit out at Karan's critics and said that making a film like he does was actually very tough. 'I always thought making his kind of cinema is very tough. Now after working with him, I respect Karan's cinema even more. Even those who don't like cinema will sit up and take notice. He's taken a subject no one expects him to and has tackled it sensitively. 'Karan has beautifully juxtaposed a very commercial language with real believable characters and situations,' remarked Abhishek. Despite being the junior-most member of the crew, Abhishek felt as though the whole shoot was like a holiday due to the comfort level he shared with all his co-stars. 'I was working with my friends - Rani, Preity, Shah Rukh and Dad ... They're people I hang around with regularly. It was like a holiday and it was a bonus with Rani there as I have worked with her extensively earlier. Shah Rukh and Preity are friends ... We meet at Shah Rukh's house often. Instead of meeting after work we met at work as well,' said Abhishek. 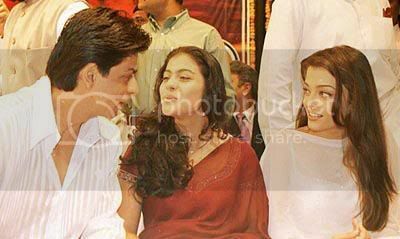 SRK Fan Club - - Part 14!